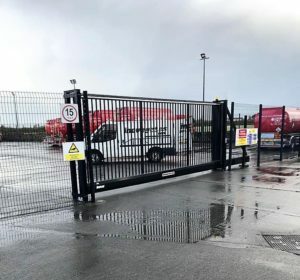 Inova Gates Limited have another Sliding Gate and matching Security Fencing installation on behalf of Atlantic Oils Head Office, North Commons, Ardfert, Co. Kerry . 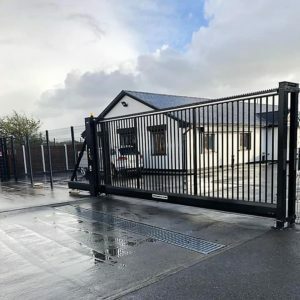 The project comprised of a new Cantilevered INOVA Industrial 280 ESI sliding gate 2400mm high with a clear opening of 6000mm with a serrated edge spike. The gate was finished in RAL 9005 Black PPC. 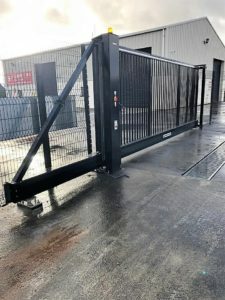 An additional GSM access control system was incorporated with this gate. 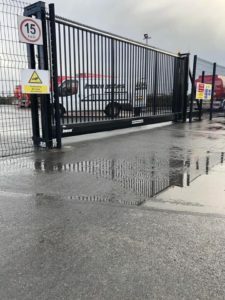 In addition to the Sliding Gate we installed new Perimeter Security Fencing 2400mm high complimenting the entrance gate and providing the complete security package around their commercial premises.